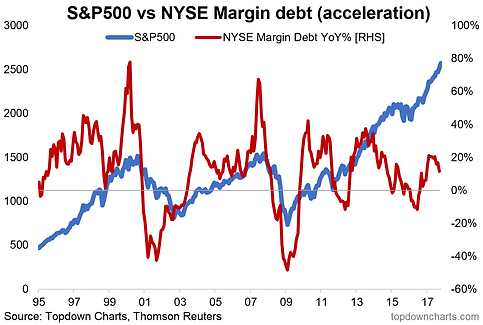 NYSE Margin Debt is an important indicator for US equities as it both reflects sentiment and tracks the amount of leverage and buying power (or lack thereof) in the market. The leverage aspect is important because as leverage rises so too does risk – in many ways the signal is similar to that of valuations in that higher valuations, all else equal, tend to mean higher risk over the medium term. Thus it is interesting to note that US margin debt reached a new all time high in September (note the data comes out monthly with a lag, so the September data is the latest and was out last week). Looking at the chart of us stock market margin debt you can see that peaks in margin debt or new highs in margin debt were often present around major market tops. Indeed, many have pointed to this chart as a sign of investor euphoria and something to be mindful of from a risk management standpoint. However, like many forms of market and economic data it is useful to transform it in order to obtain a more useful signal. In this case we take the annual change in margin debt - referring to this as margin debt acceleration. There are two warning signs for this one; a. when it spikes to extreme levels of acceleration, and b. when it rolls over and goes negative. At this point it has rolled over and so is on a watching brief. 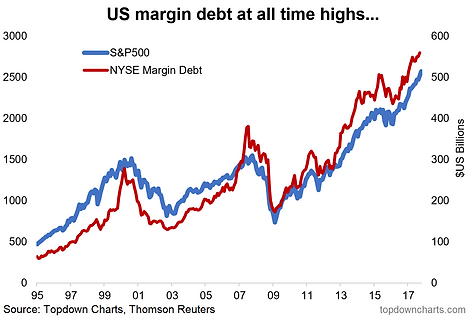 NYSE margin debt has reached a new all time high, raising concerns about a potential market top. A more useful expression of this data is the annual percentage change or "acceleration" and at this point it has rolled over which is a mild warning sign, which would intensify as a bearish signal should it turn negative. This is one risk indicator to have as part of your toolkit. For more and deeper insights on global economics and asset allocation, and some more good charts you may want to subscribe to the Weekly Macro Themes. Click through for free look or a trial. Author: Top Down ChartsTopdown Charts: "chart driven macro insights" Based in Queenstown, New Zealand, Topdown Charts brings you independent research and analysis on global macro themes and trends. Topdown Charts covers multiple economies, markets, and asset classes with a distinct chart-driven focus. We are not bound by technical or fundamental dogma, and instead look to leverage any relevant factor to capture the theme. As such, here you will find some posts that are purely technical strategy, some that just cover economics and data, and some posts that use multiple inputs to tell the story and identify the opportunities. Callum Thomas Head of Research Callum is the founder of Topdown Charts. He previously worked in investment strategy and asset allocation at AMP Capital in the Multi-Asset division. Callum has a passion for global macro investing and has developed strong research and analytical expertise across economies and asset classes. Callum's approach is to utilise a blend of factors to inform the macro view.